Until recently, additive manufacturing, or as it is better known 3D printing, seemed like science fiction, but it is now a reality and here to stay. In the home, it may still be just the latest gadget, but industry sectors like aeronautics, automotive and medicine are already taking full advantage of this new technology. Additive manufacturing allows the creation of objects that could not be produced with traditional manufacturing techniques. It is especially useful for manufacturing multi-component items as a single unit. Simpler items with one or only a few parts can also be produced at a more reasonable cost. Rapid prototyping. One of the key benefits of additive manufacturing is the acceleration of the production process. Prototypes can be created almost instantly and the capability to introduce design modifications in real time affords an enormous competitive advantage, providing time and costs savings and contributing to the quality of the final design. Tooling: The production of tools in-house allows manufacturers to modify and improve tool design, customizing them for specific uses. Being able to do this without relying on external contractors results in considerable time savings. The applications of additive manufacturing are set to grow as progressively more integrated technologies become available. Their use in the development of new products will allow integration of design optimization, verification of performance, and the validation of the manufacturing process itself. 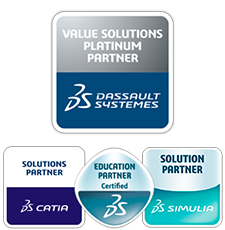 Dassault Systèmes has produced specific developments through CATIA and SIMULIA, in close collaboration with companies like AIRBUS and SAFRAN. As the leading provider of design and calculation tools, the company offers a true end-to-end solution within its innovative 3DExperience platform. This technology holds the potential to support specific processes and also validate design, materials, manufacturing, supply chain, and production planning. It allows all the actors to operate on the same platform and in the same work environment. Evaluation of performance throughout the useful life of the process. The potential applications of additive manufacturing are colossal, as are the possible benefits. The time and costs savings along are already a deciding factor in certain specialized sectors. But what other benefits can additive manufacturing provide? If you are involved in an innovative project using additive manufacturing, please let us know.